Objective: Incident Management aims to manage the lifecycle of all Incidents (unplanned interruptions or reductions in quality of IT services). The primary objective of this ITIL process is to return the IT service to users as quickly as possible. Incident Management according to ITIL V3 distinguishes between Incidents (Service Interruptions) and Service Requests (standard requests from users, e.g. password resets). Service Requests are no longer fulfilled by Incident Management; instead there is a new process called Request Fulfilment. There is a dedicated process in ITIL V3 for dealing with emergencies ("Handling of Major Incidents"). Furthermore a process interface was added between Event Management and Incident Management. Significant Events are triggering the creation of an Incident. ITIL 2011 describes Incident Management in greater detail: The process overview is showing the most important interfaces (see Fig. 1). Guidance has been improved in Incident Management on how to prioritize an Incident (see Checklist Incident Prioritization Guideline). Additional steps have been added to Incident Resolution by 1st Level Support to explain that Incidents should be matched (if possible) to existing Problems and Known Errors. Incident Resolution by 1st Level Support and Incident Resolution by 2nd Level Support have been considerably expanded to provide clearer guidance on when to invoke Problem Management from Incident Management. The emphasis is now on restoring services as quickly as possible, and to seek the help of Problem Management if the underlying cause of an Incident cannot be resolved with a minor Change and/or within the committed resolution time. 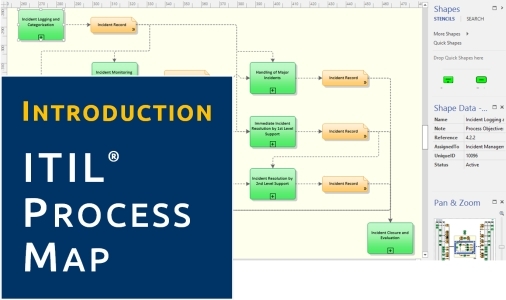 The Incident Management sub-process Incident Closure and Evaluation now states more clearly that it is important to check whether there are new Problems, Workarounds or Known Errors that must be submitted to Problem Management. Process Objective: ITIL Incident Management Support aims to provide and maintain the tools, processes, skills and rules for an effective and efficient handling of Incidents. Process Objective: To record and prioritize the Incident with appropriate diligence, in order to facilitate a swift and effective resolution. Process Objective: To solve an Incident (service interruption) within the agreed time schedule. The aim is the fast recovery of the IT service, where necessary with the aid of a Workaround. As soon as it becomes clear that 1st Level Support is not able to resolve the Incident itself or when target times for 1st level resolution are exceeded, the Incident is transferred to a suitable group within 2nd Level Support. Process Objective: To solve an Incident (service interruption) within the agreed time schedule. The aim is the fast recovery of the service, where necessary by means of a Workaround. If required, specialist support groups or third-party suppliers (3rd Level Support) are involved. If the correction of the root cause is not possible, a Problem Record is created and the error-correction transferred to Problem Management. Process Objective: To resolve a Major Incident. Major Incidents cause serious interruptions of business activities and must be resolved with greater urgency. The aim is the fast recovery of the service, where necessary by means of a Workaround. If required, specialist support groups or third-party suppliers (3rd Level Support) are involved. If the correction of the root cause is not possible, a Problem Record is created and the error-correction transferred to Problem Management. Process Objective: To continuously monitor the processing status of outstanding Incidents, so that counter-measures may be introduced as soon as possible if service levels are likely to be breached. Process Objective: To submit the Incident Record to a final quality control before it is closed. The aim is to make sure that the Incident is actually resolved and that all information required to describe the Incident's life-cycle is supplied in sufficient detail. In addition to this, findings from the resolution of the Incident are to be recorded for future use. Process Objective: To inform users of service failures as soon as these are known to the Service Desk, so that users are in a position to adjust themselves to interruptions. Proactive user information also aims to reduce the number of inquiries by users. This process is also responsible for distributing other information to users, e.g. security alerts. Process Objective: ITIL Incident Management Reporting aims to supply Incident-related information to the other Service Management processes, and to ensure that that improvement potentials are derived from past Incidents. A report supplying Incident-related information to the other Service Management processes. An Incident Model contains the pre-defined steps that should be taken for dealing with a particular type of Incident. This is a way to ensure that routinely occurring Incidents are handled efficiently and effectively. A message containing the present status of an Incident sent to a user who earlier reported a service interruption. Status information is typically provided to users at various points during an Incident's lifecycle. Major Incidents cause serious interruptions of business activities and must be solved with greater urgency. See also: Checklist Incident Priority: Major Incidents. A Major Incident Review takes place after a Major Incident has occurred. The review documents the Incident's underlying causes (if known) and the complete resolution history, and identifies opportunities for improving the handling of future Major Incidents. The reporting of a service failure to the Service Desk, for example by a user via telephone or e-mail, or by a system monitoring tool. Escalation regarding the processing of an Incident or Service Request, initiated by a user experiencing delays or a failure to restore their services. Self-help information for users supplied by the Service Desk, usually as part of the Support Pages on the intranet. The Incident Manager is responsible for the effective implementation of the Incident Management process and carries out the corresponding reporting. He represents the first stage of escalation for Incidents, should these not be resolvable within the agreed Service Levels. The responsibility of 1st Level Support is to register and classify received Incidents and to undertake an immediate effort in order to restore a failed IT service as quickly as possible. If no ad-hoc solution can be achieved, 1st Level Support will transfer the Incident to expert technical support groups (2nd Level Support). 1st Level Support also keeps users informed about their Incidents' status at agreed intervals. 2nd Level Support takes over Incidents which cannot be solved immediately with the means of 1st Level Support. If necessary, it will request external support, e.g. from software or hardware manufacturers. The aim is to restore a failed IT service as quickly as possible. If no solution can be found, the 2nd Level Support passes on the Incident to Problem Management. 3rd Level Support is typically located at hardware or software manufacturers (third-party suppliers). Its services are requested by 2nd Level Support if required for solving an Incident. The aim is to restore a failed IT Service as quickly as possible. A dynamically established team of IT managers and technical experts, usually under the leadership of the Incident Manager, formulated to concentrate on the resolution of a Major Incident. A: Accountable according to the RACI Model: Those who are ultimately accountable for the correct and thorough completion of the Incident Management process. R: Responsible according to the RACI Model: Those who do the work to achieve a task within Incident Management. In cooperation, as required. 2nd Level Support Groups often include Applications Analysts and/ or Technical Analysts.